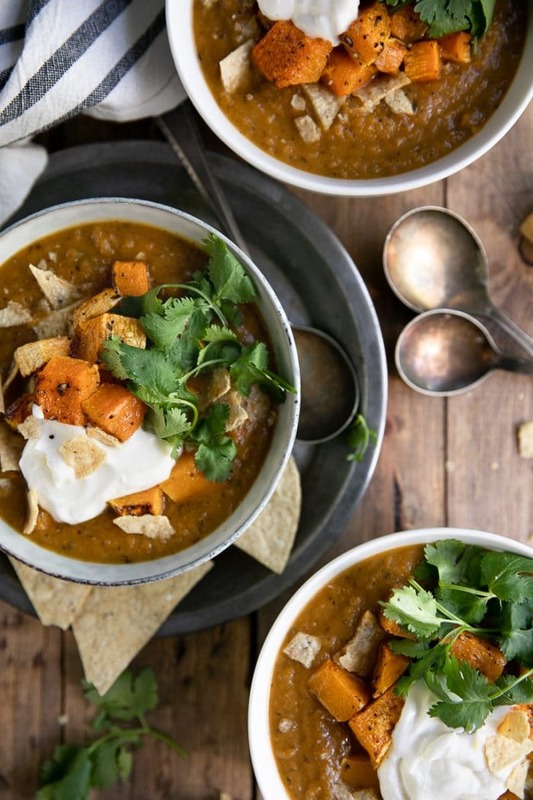 Butternut Squash Black Bean Soup. 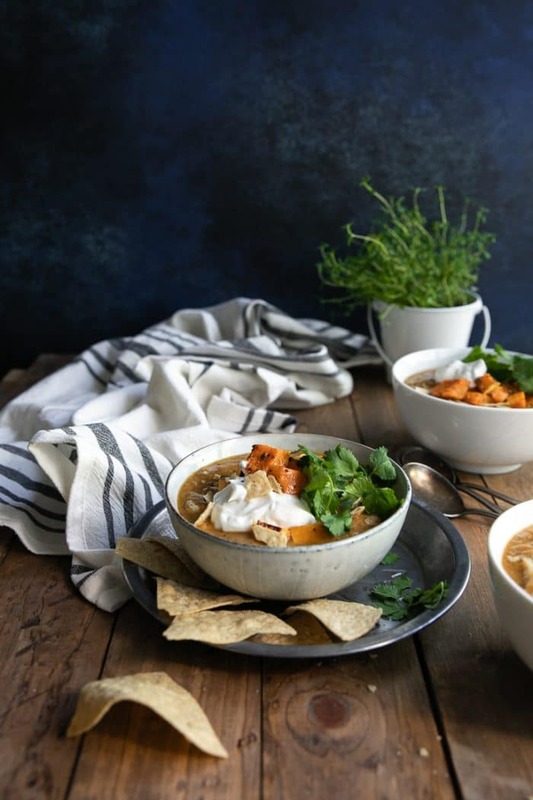 Delicious, healthy, and creamy, this comforting butternut squash and black bean soup is everything you need to keep warm through the cold winter months. 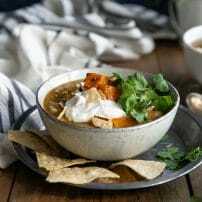 Made with roasted butternut squash, black beans, and flavorful taco seasoning, one bowl is never enough! I think I’m addicted to cookies. Ok, ok. I know. You’re probably wondering what this possibly has to do with Butternut Squash Black Bean Soup. But, there’s a story here. Don’t worry, it’s short. So you know how I talk all the time about my obsession with cookies? Well, I haven’t had any cookies in two days. TWO DAYS! Now I plan to bake sugar cookies, thumbprint cookies, cake mix cookies, and a slow cooker dump cake. Rather than stop by TJs after picking up O from school today to get things like vegetables or… dinner… I went to Walmart and purchased sprinkles and various other essentials to start my own bakery. Octavian is thrilled because I guess we’re having cookies for dinner (kidding! kinda), but my husband? not so much. Whatever. 2 against 1. We win! Ok, 75% of the time. Pizza and fresh buttered bread is my bff for a solid week out of each month. It’s completely out of my hands. Anyway, who really needs delicious tasting naughty food when you can have delicious tasting healthy food? Healthy (delicious!) 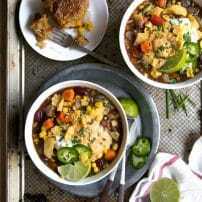 food like this Vegetarian Butternut Squash Black Bean Soup. Creamy, full of veggies and seriously comforting on a cold chilly night. You can use pumpkin or butternut squash, but unless I’m baking I typically cook with butternut squash. Bonus- the black beans pack a surprise protein punch which helps keep you feeling full a little longer. 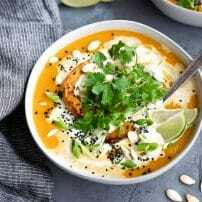 This soup is super easy to prepare and makes a great addition to any party, potluck or as the main course on a busy weeknight. And let’s not forget the toppings! You can really go crazy with the toppings on this soup. 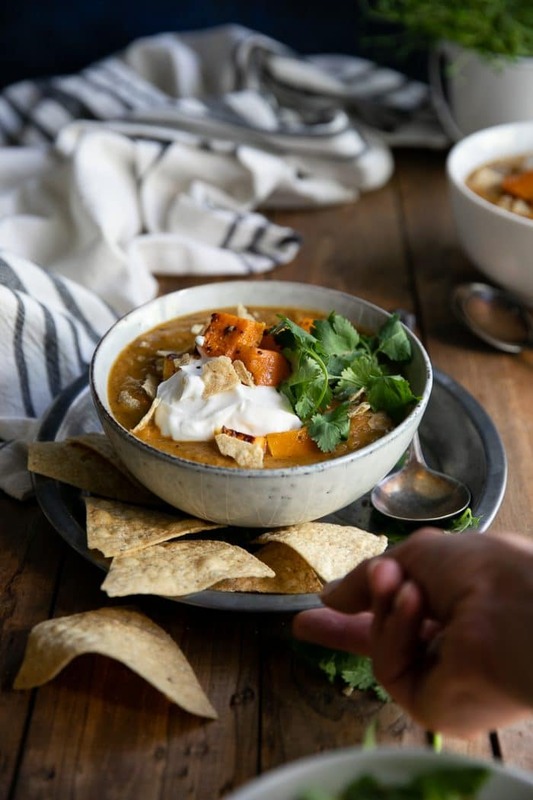 DON’T FORGET TO PIN THIS VEGETARIAN BUTTERNUT SQUASH BLACK BEAN SOUP AND SAVE IT FOR LATER. 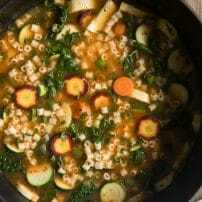 EASY AND HEALTHY, THIS SOUP IS A MUCH LOVED DINNER TIME FAVORITE. Butternut Squash Black Bean Soup. 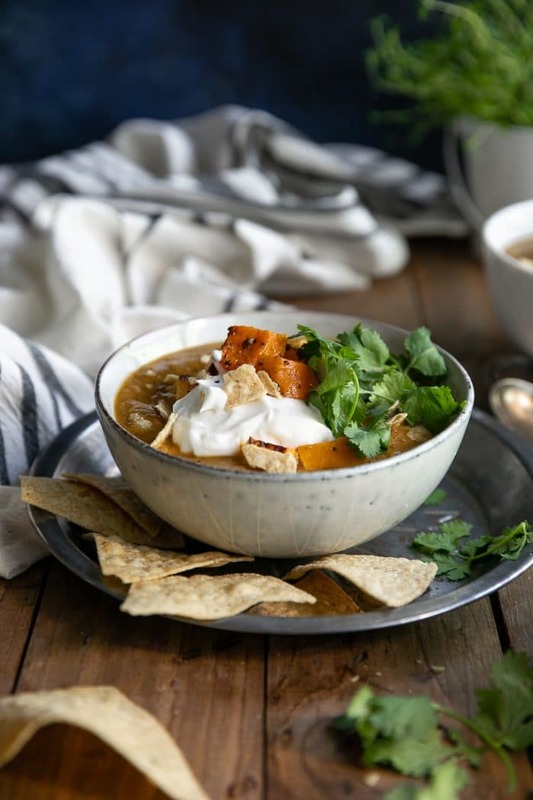 Delicious, healthy, and creamy (minus the cream), this comforting butternut squash and black bean soup is everything you need to keep warm through the cold winter months. Roast the butternut squash- Preheat oven to 375 degrees F and line two large baking sheets with parchment paper. Using a large, sturdy knife to cut ends from the butternut squash and slice the skin using a vegetable peeler or paring knife. Cut the squash in half lengthwise. Scoop out the seeds and stringy bits from each half and discard seeds (or save for roasting). Cut the squash into cubes and toss with olive oil, salt, and pepper. Transfer to the prepared baking sheets and bake for approximately 25 minutes, or until cooked to desired doneness. As the butternut squash is cooking, heat the remaining olive oil in a large pot or Dutch oven over medium-high heat. Add the onion and shallots and mix well to combine. Sauté for 3-4 minutes, stirring frequently. Add the chopped carrots and celery and stir to combine. Cook, stirring frequently, for an additional 5 minutes. Stir in the garlic, salt, pepper, taco seasoning, and cayenne. Mix well and cook for one minute before adding the vegetable broth and water. Increase heat to high and bring to a boil. Reduce heat to low, cover, and simmer for approximately 10 minutes. Drain and rinse two (15-ounce) cans of black beans. Add the drain black beans and half of the butternut squash to the pot. Cover and cook for an additional 5 minutes. Working in batches, puree the soup, only filling the bowl of your blender half way to prevent accidents. Once the entire pot of soup has been completely pureed into a smooth and creamy soup, season to taste (it will probably need more salt). If soup is too thick, add additional water or broth until desired consistency is reached. 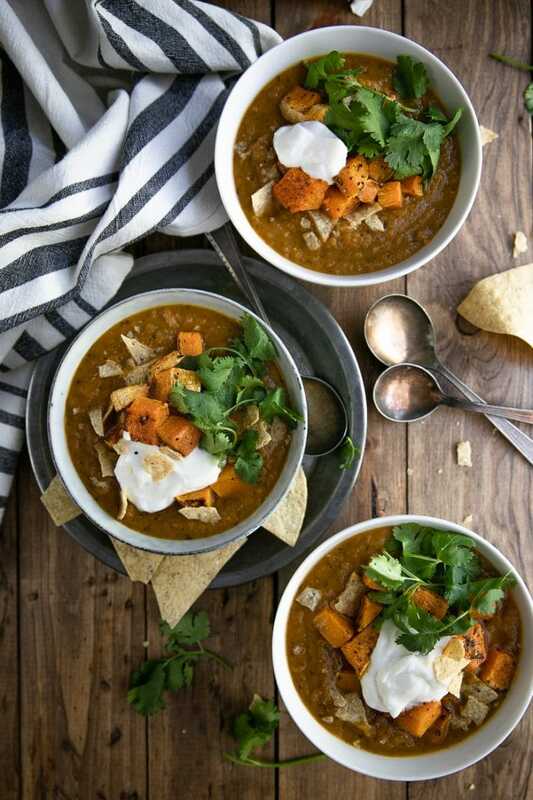 Garnish soup with sour cream, fresh cilantro, green onion, pumpkin seeds, additionally roasted butternut squash, and crushed tortilla chips, if desired.